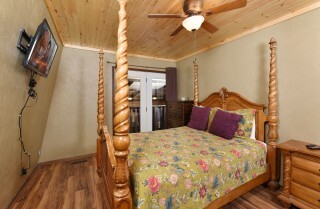 You work hard throughout the year, so why not plan a relaxing vacation at The SwimInn Place? 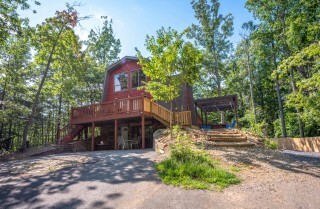 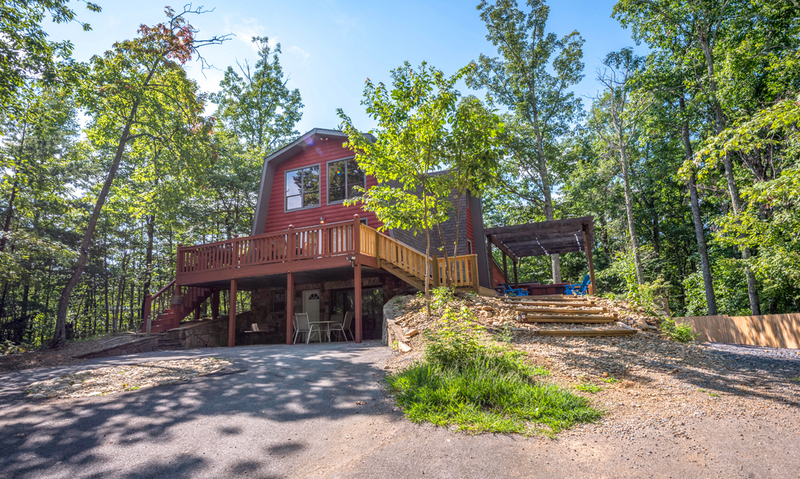 This 4-bedroom, 2 1/2-bath cabin is an ideal choice for family vacations and small group getaways. You’ll have a separate space for the kids in the accommodating loft, tons of options for play in your versatile rec room, and plenty of room to spread out with this cabin’s 3,000 square feet of space! The SwimInn Place also provides the right mix of tranquility and convenience with its quiet location among the Smoky Mountain trees near downtown Gatlinburg (less than 5 miles from the cabin). 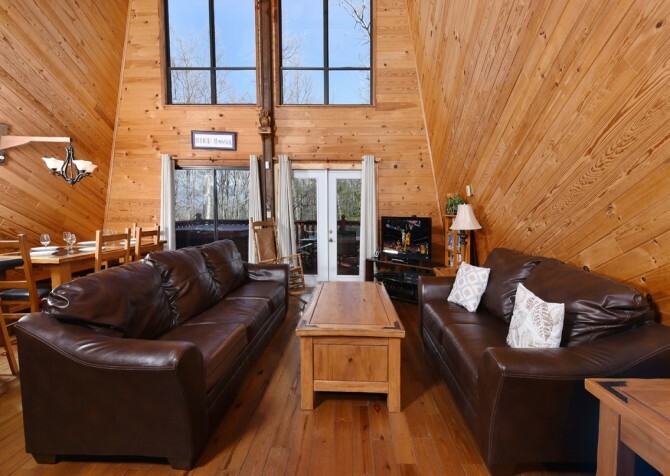 Inside, enjoy 3 floors with sleeping accommodations for up to 13 guests, an open-concept main floor, and additional living space (plus a rec room) on the lower level. 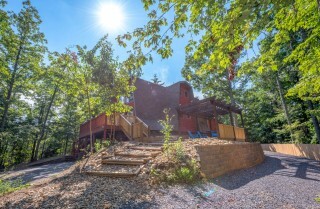 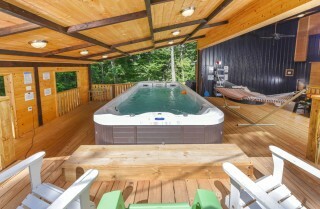 As a bonus, this Gatlinburg cabin features an 18-foot swim spa! 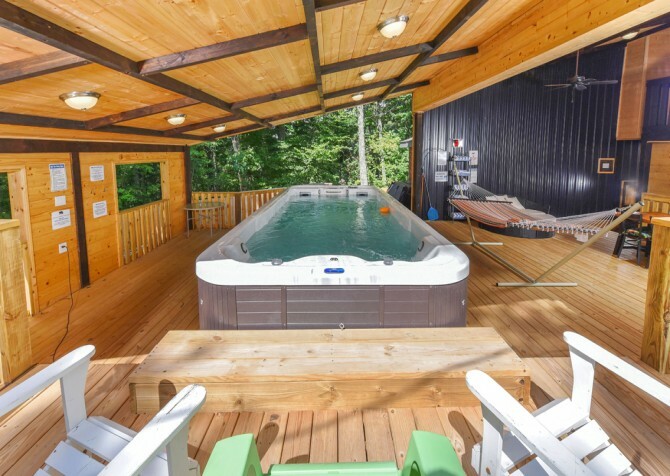 This swim spa is heated and completely enclosed, making it a functional feature for Smoky Mountain getaways any time of year. 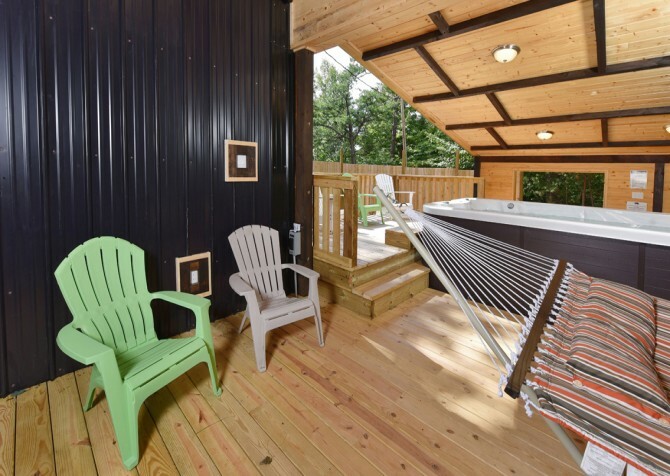 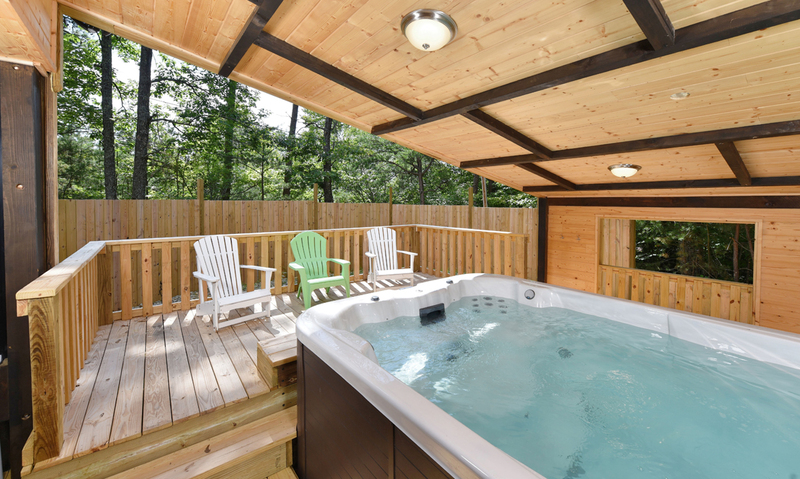 Besides all this, The SwimInn Place provides wooded views on a ¾ acre lot, a large deck with an outdoor hot tub, and all the essentials of home, including a full kitchen, high-speed internet, and access to a washer and dryer. 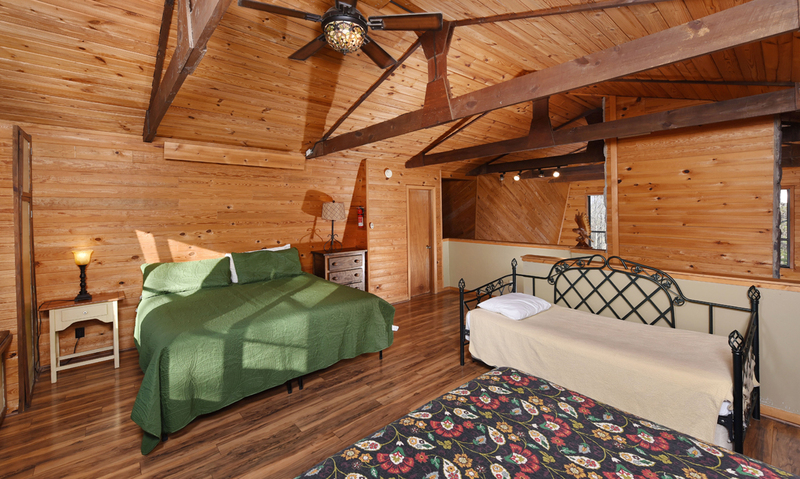 Get ready for some much-needed R&R this year with a family vacation to The SwimInn Place! 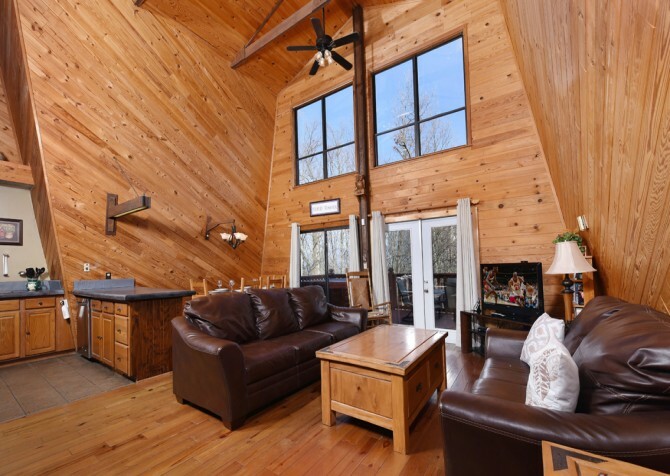 High ceilings and several large windows overlooking the Smoky Mountain trees give a sense of openness and an inviting warmth to the The SwimInn Place living room that you’re sure to enjoy. After exploring some Cabins for YOU partners* in downtown Gatlinburg, like the Ripley’s Believe It or Not! 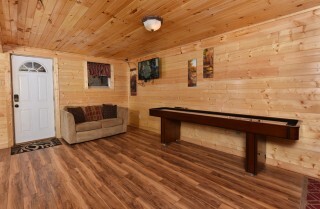 Museum, you’ll appreciate sinking into one of 2 comfy couches found in this welcoming space. 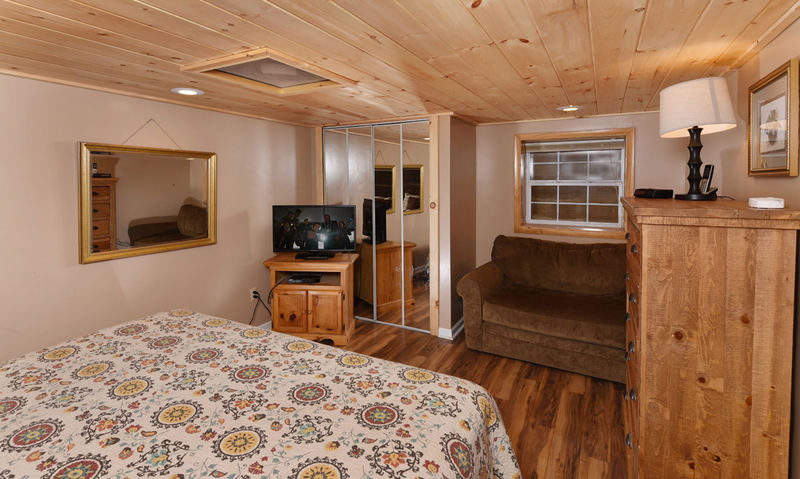 Feel free to turn on the big screen TV with a DVD player, and Charter service. You’ll also have access to a complimentary movie channel package during your stay. 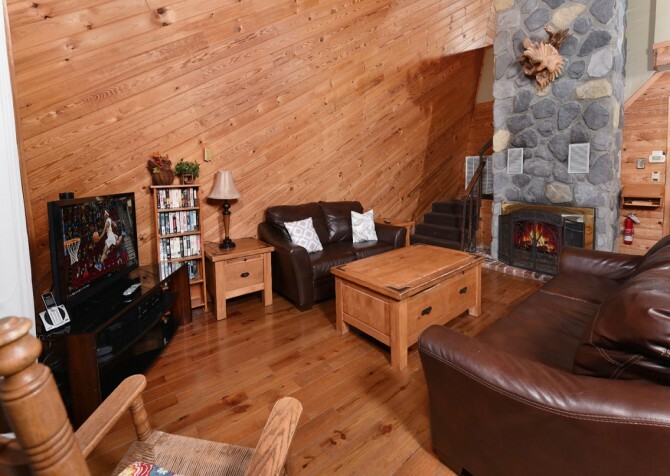 So bring the popcorn and plan for at least one family-friendly movie night at the cabin! Along with these extras, The SwimInn Place’s living room provides all the comforts of home: a large coffee table for drinks, snacks, or games; a rocking chair; a reading lamp; and an impressive stone-set (wood-burning) fireplace. 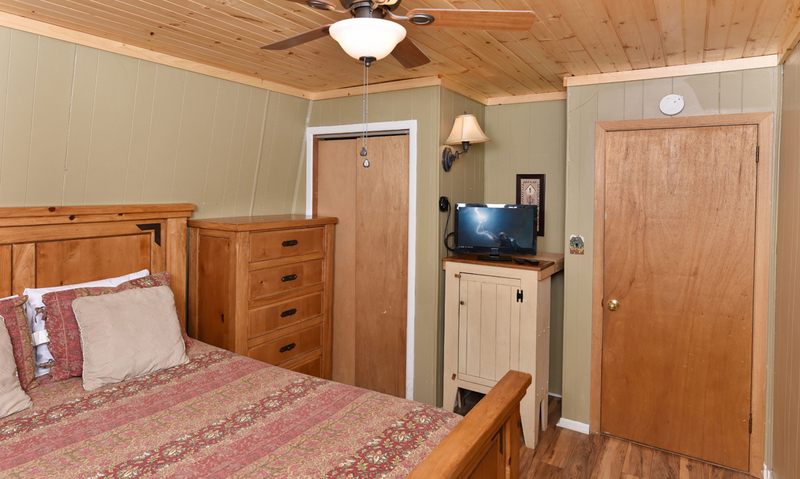 At The SwimInn Place, you’ll stay cozy no matter when you visit and find the right amount of space to spread out and stay comfortable. 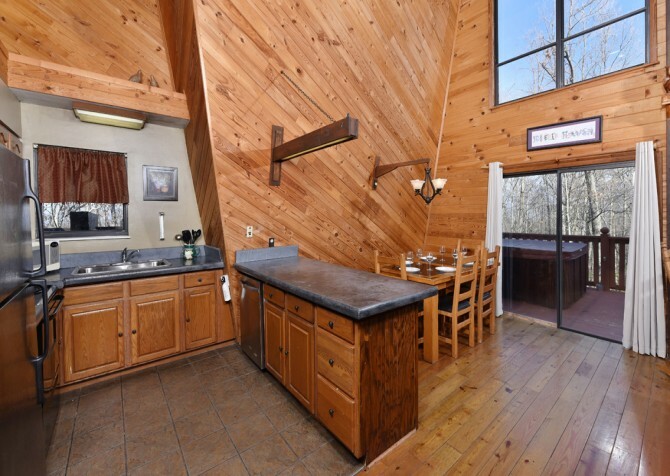 No matter how long you plan to stay at The SwimInn Place, you’ll appreciate this cabin’s fully equipped kitchen. 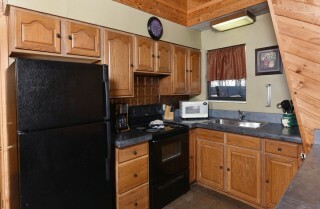 Perfect for storing leftovers after dining in downtown Gatlinburg or cooking a homemade meal for the whole group, this kitchen provides all your major appliances in black, unique concrete countertops, and all your cooking essentials including knives, plates, and cookware. Although cooking for 13 can sound intimidating, you can easily store grab-and-go items at the cabin for breakfast and lunch. 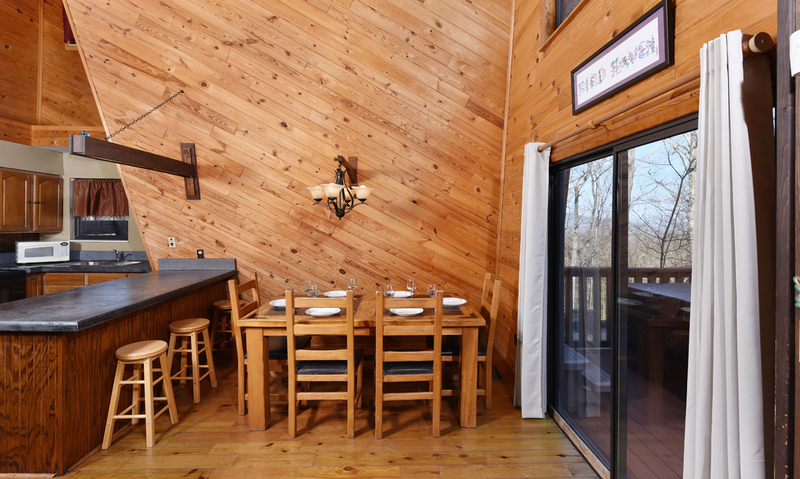 For dinner, try simple recipes like lasagna with no-boil noodles or a big pot of chili. Cooking in will allow your group to save money, save driving time, and enjoy each other’s company in the privacy of your dining room throughout your Gatlinburg stay. The dining room offered by The SwimInn Place features a dining table for 6 with a modern light fixture overhead. 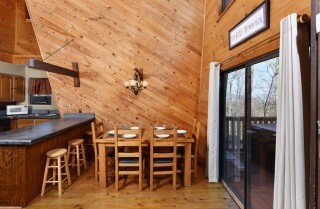 For meals during the day, enjoy the natural light flowing in from the large windows located behind the dining room. 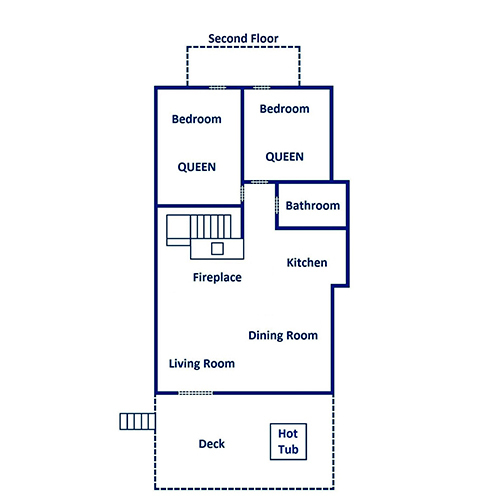 And if your group needs more space, simply spread out to the 4-piece breakfast bar attached to the kitchen, the couches in the open-concept living room, or the large outdoor dining table on the deck. 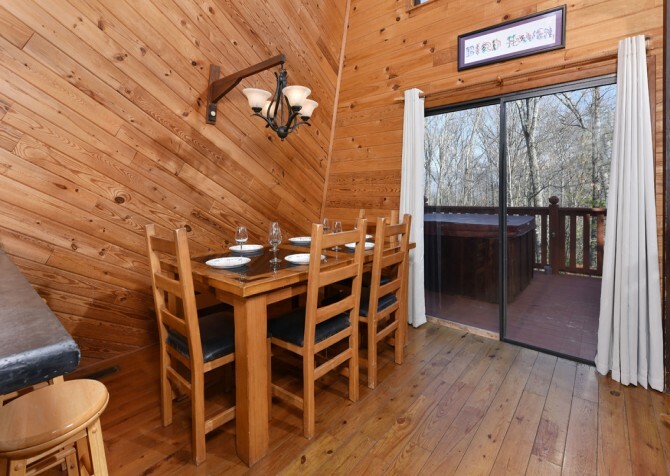 The best part about enjoying meals at the cabin is enjoying each other’s company, so be sure to take advantage of these intimate spaces that are certain to make your group feel right at home! 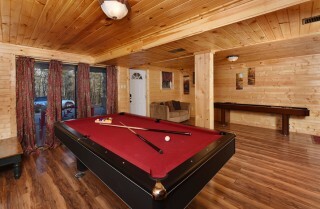 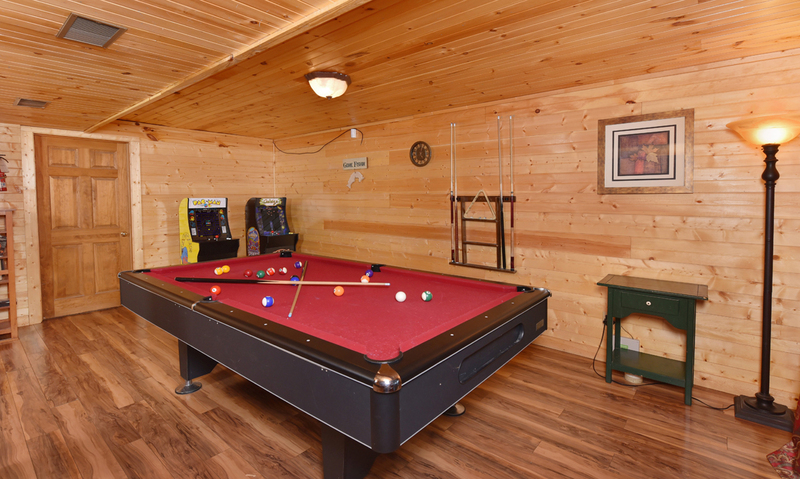 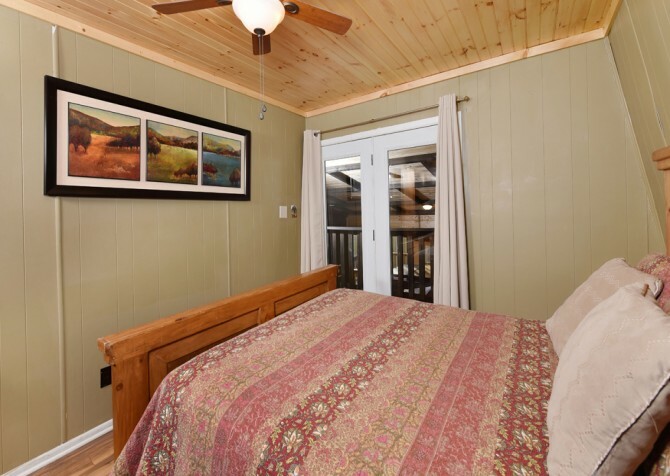 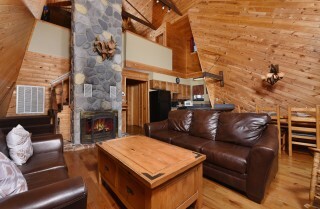 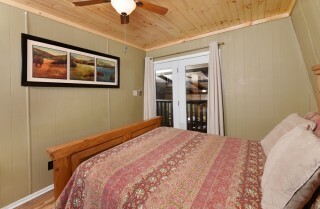 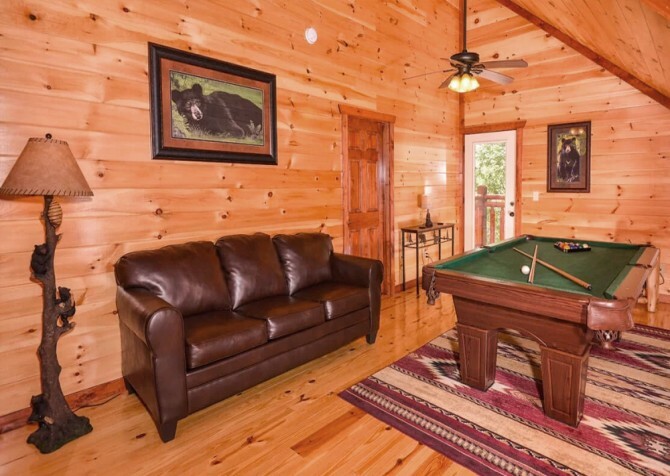 Moving to the lower level of the cabin, you’ll enjoy the large rec room provided by The SwimInn Place. 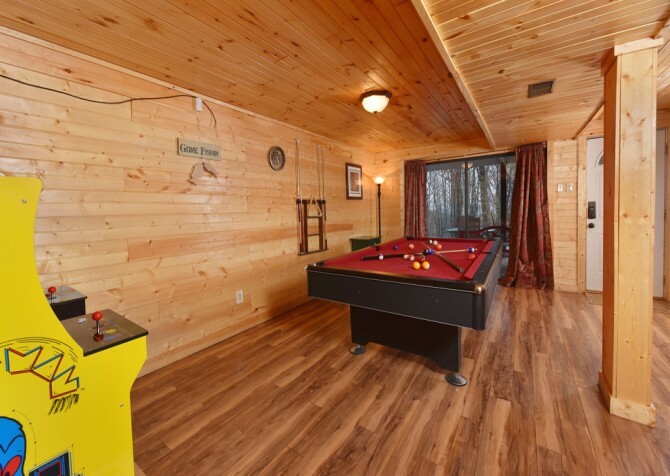 This open room provides tons of space filled with game tables for hours of fun, including a pool table, foosball game, and shuffleboard table. 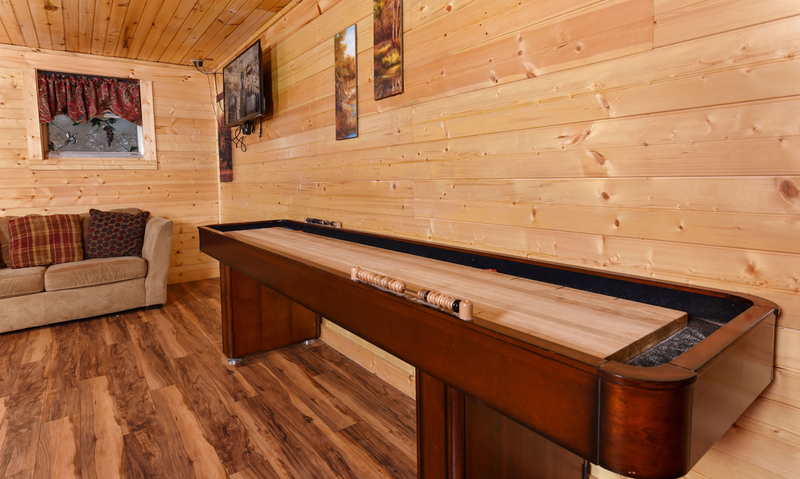 Inside the rec room, you’ll also find a comfy couch, coffee table, and 40-inch flatscreen mounted on the wall. 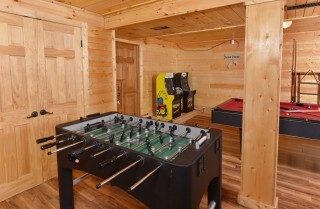 Let the kids have this space as a separate hangout, or let it be the guys’ room on your Gatlinburg getaway. A great spot for board games, movies, and hours of indoor play, the rec room inside The SwimInn Place will be a favorite place to have fun while you’re in the Smokies. 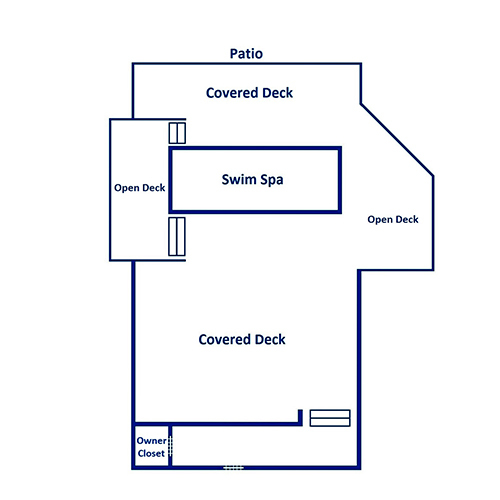 Without doubt, another favorite place for fun inside The SwimInn Place is at your private 7' x 19' covered (but not enclosed) swim spa! The swim spa is 4 1/2 feet deep and kept around 95 to 104 (max), with multiple deck chairs all around. 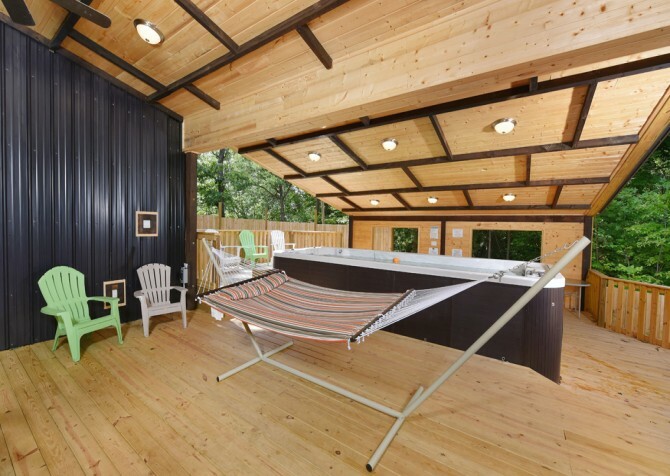 This swim spa offers private views of the Smoky Mountain trees while you swim. It even has bluetooth and a speaker system, so you can rock your favorite music while hanging out. 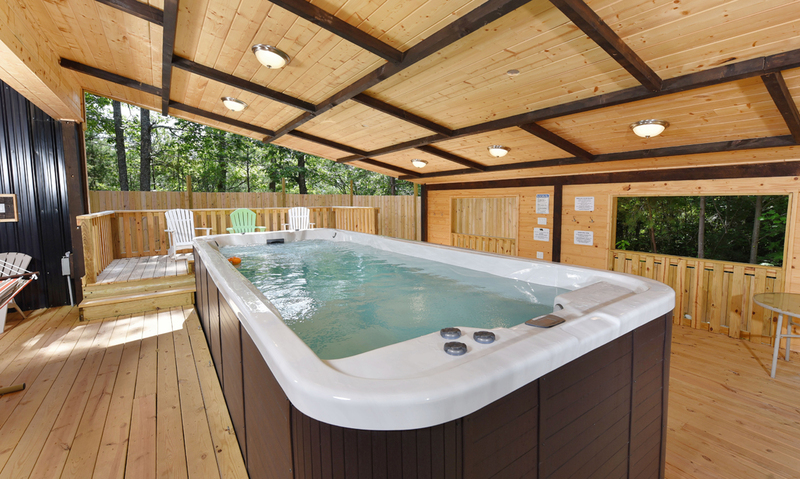 And the great thing about having your own swim spa is you won’t have to fight the crowds in the summer or miss out on family pool time even in the middle of winter. 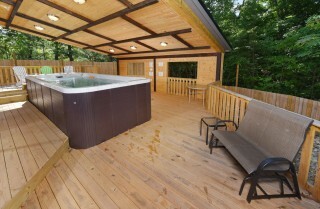 No matter when you visit the Smokies, you can take advantage of this extra-special amenity at The SwimInn Place. The SwimInn Place offers plenty of sleeping space spread out over 3 levels. 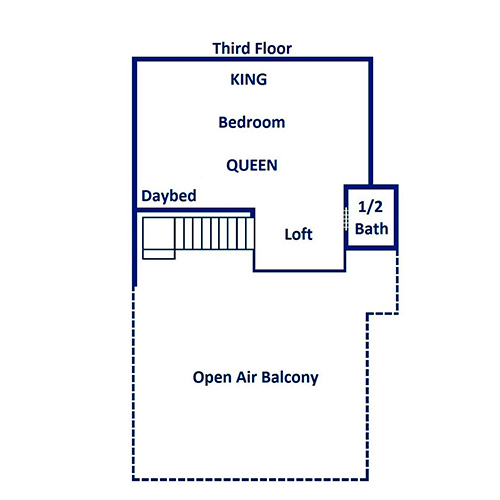 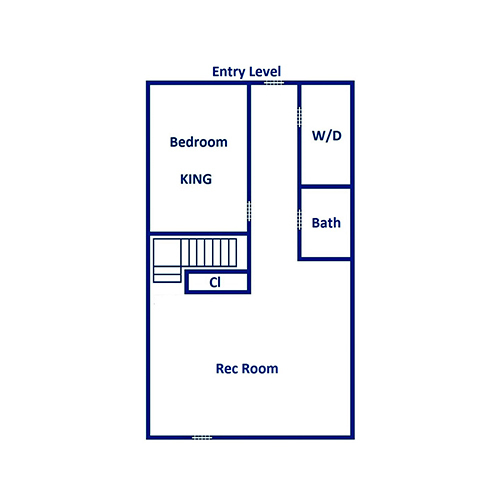 On the entry level, you’ll find 2 bedrooms with queen-size beds. 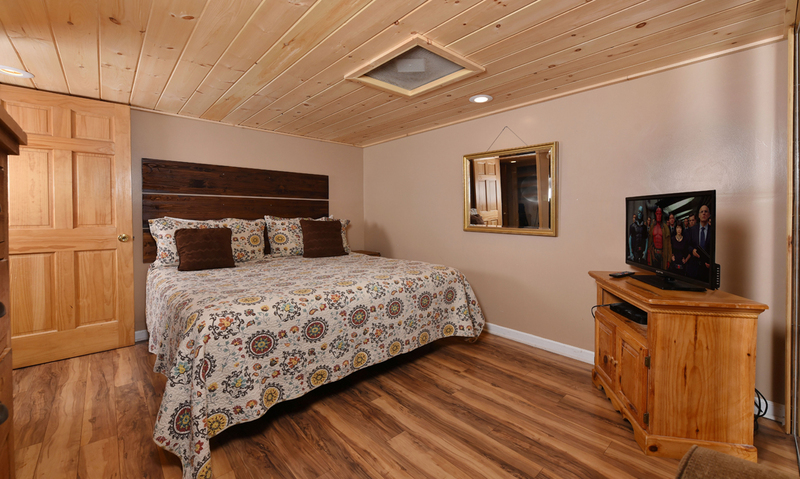 At the bottom level, The SwimInn Place offers a king-size bed and a twin sleeper sofa. In the loft, you’ll find a king-size bed, queen-size bed, twin daybed, and twin trundle. 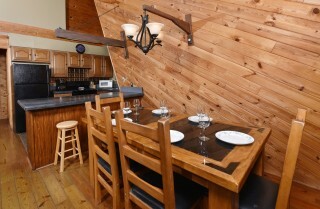 The loft is ideal for families with children, or you can let all the kids stay together in this large space. 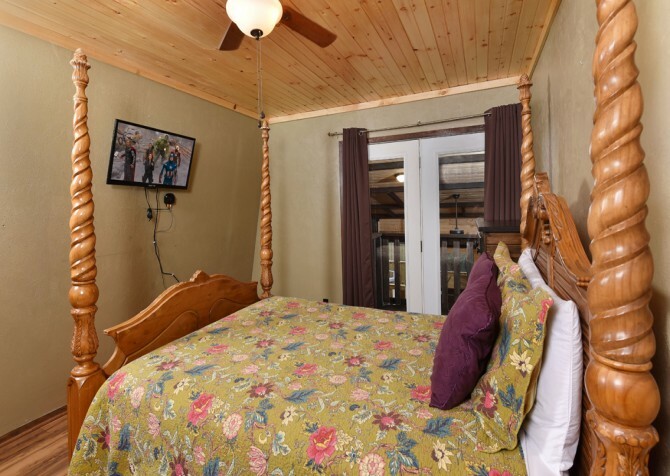 Total, The SwimInn Place will comfortably accommodate up to 13 guests, and each bedroom features its own TV with Roku devices or DVD players, which offer Netflix and Hulu Plus service. Situated on a ¾ acre lot in the Smoky Mountain trees, The SwimInn Place offers the tranquility you’re looking for in a Gatlinburg getaway. 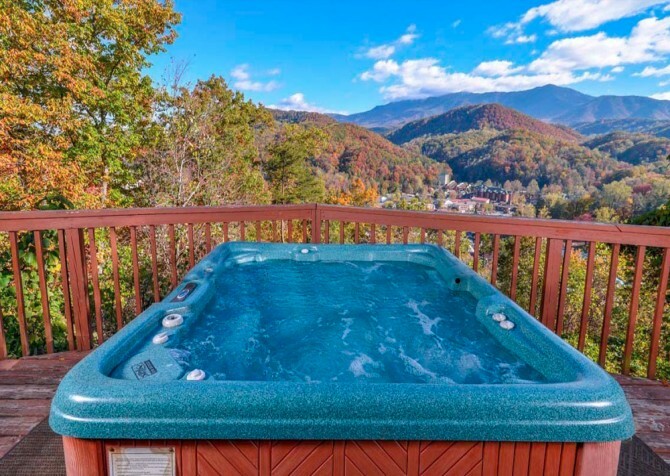 On the back deck, soak in these sights from your outdoor hot tub, which is perfect for relieving sore muscles after hiking to waterfalls in the Great Smoky Mountains National Park. 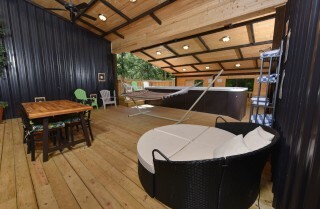 You’ll also find an outdoor patio set with room for nearly half your group. 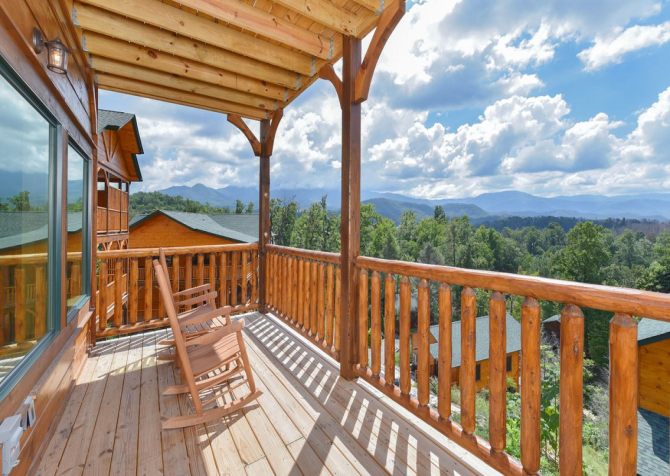 Use your charcoal grill to make delicious steaks or hamburgers, and enjoy Smoky Mountain summer nights together on the deck. 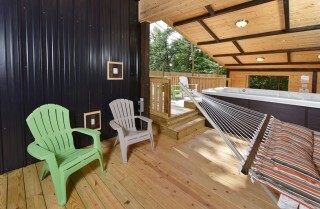 A second patio table can be found below the deck, offering shade during the day. Grab a pack of cards, fix a glass of sweet tea, and spend time together in the great outdoors at The SwimInn Place. Along with its large living spaces, full kitchen, and other convenient amenities, The SwimInn Place offers a washer and dryer, which means no overflowing loads of laundry when you get back home. This cabin also provides high-speed internet access throughout your stay. 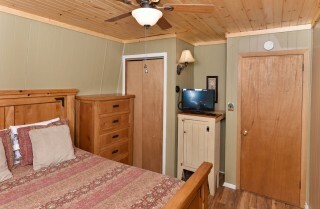 So don’t forget to pack your laptops, tablets, and other favorite devices before you head to The SwimInn Place. Last but not least, this small group cabin provides a luxury in the Smoky Mountain hills: paved parking! 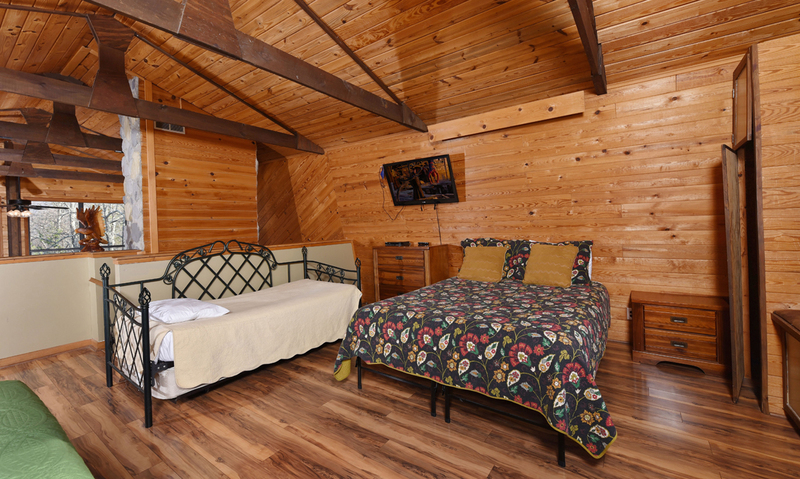 Another Cabins for YOU partner, Ripley’s Mini-Golf features rustic wood buildings, models of bears, and more at two 18-hole courses. 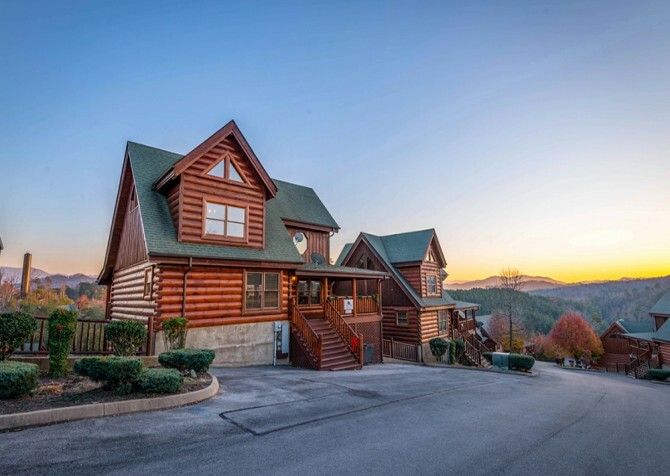 With original musical comedies and a setting that harkens back to the old Music Halls of the 1890s, it’s no wonder Sweet Fanny Adams has been a favorite Gatlinburg attraction for decades! 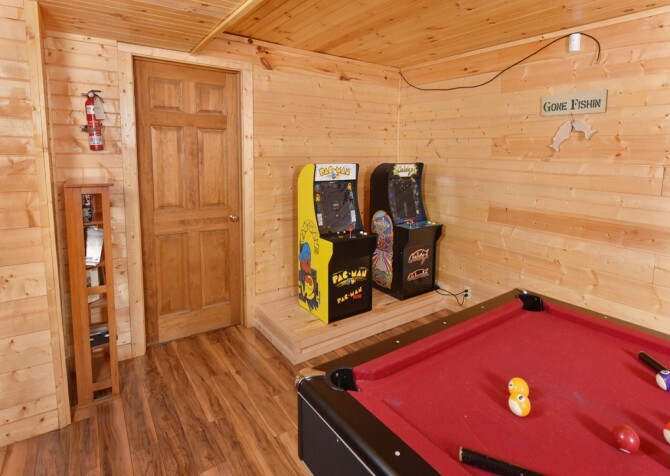 All ages will find something to do at Fort Fun, whether you’re playing mini-golf, riding bumper cars, mining for gems, or trying to escape! *Cabins for YOU partners offer discounts to all our guests. Ask a vacation planner for more information. "Such a cool cabin with plenty of space and the porch with pool was so awesome! Absolutely great stay!"